Pamela Pogue has been involved in design and fashion since childhood, starting when she was among the top models in Minneapolis for over seven years. Pamela’s academic pursuits were focused on design, art, textiles and fashion, with a career in advertising, design and marketing. In addition to running her business, Pamela has traveled extensively. Many of the stones, gems and metals in the juelerie collection were acquired by Pamela in her journeys. Her international experiences and her awareness of the visual influences in everyday life at home and abroad – nature, fashion, graphic design, cultural arts – inspire her use of color and materials. Combining unique materials has become a hallmark of the juelerie collection, with Pamela coordinating unexpected colors, textures, shapes, vintage and contemporary beads with distinctive clasps to create original designs. Her clients refer to their juelerie pieces as "Pamela art". juelerie is an original, one-of-a-kind and limited edition designer fashion collection of beaded jewelry that is unique to the market. Designs include wearable bold jewelry and long dramatic, intricate styles in combinations of exquisite materials, interesting colors, and sensuous textures - designs that stir the spirit. Pamela takes a sensuous approach to design and style, viewing skin, hair, coloration and wardrobe as a total package to set off her jewelry designs. Pamela also finds that knowledge of the metaphysical properties of the stones, gems, minerals, and metals enhances the wearer’s experience. • The juelerie collection includes Murano glass from Italy, Turquoise from the Kingman mine in Arizona and from China, large tumbled sea glass nuggets from Indonesia, Prehnite and Chrysoprase from Australia, red Coral and freshwater Pearls from China, Bali silver, Peruvian Opals, and fine silver from Thailand, to name a few. • Rare and vintage materials including sterling silver, hand blown glass, acrylic buttons, crystal beads, red abalone, Tahitian black pearl, Murano glass appear throughout the collection. • Each piece is named by the designer. • Pamela has been commissioned to create one-of-a-kind designs incorporating clients’ rare and/or precious heirloom jewelry into contemporary and wearable pieces. 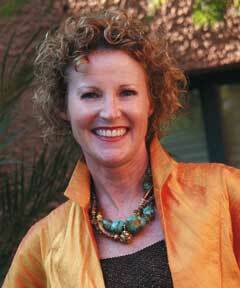 • Based in San Diego, California, Pamela has clients nationwide. • The juelerie collection has been shown at Bloomingdale's, San Diego Museum of Art, The Museum Store, M bride Bridal Salon, Delores Campbell Design Gallery, and various boutique stores and private events in southern California, as well as on the runway. juelerie is a trademark of juelerie. all juelerie designs are copyrighted by Pamela Pogue.